Tourists admire the scenery of the colorful Tulips, Tulipa, and the historic Prince of Wales Hotel (built in 1864), Niagara on the Lake, Ontario, Canada. 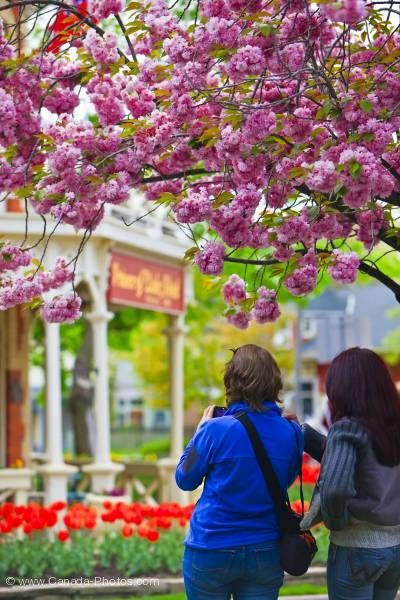 Two tourists are standing under a tree that is blooming with beautiful pink blossoms as they photograph the historic Prince of Wales Hotel. They look toward the entrance of the hotel with its sign on the front and its brilliant red tulips on the front lawn. Tourists admiring the colourful Tulips, Tulipa, and the historic Prince of Wales Hotel (built in 1864), Niagara-on-the-Lake, Ontario, Canada. Please let me show you more of my pictures from my "photo gallery: Niagara on the Lake Photos". Pictures from photo gallery "Niagara On The Lake Photos"